Dimensions: 2.5" x 5.4" x 1.1"
The UX300-EX USB FM Transmitter is a USB device intended to transmit audio from your desktop computer or notebook to nearby FM radios all over your home or office without cables or wires. This USB transmitter is a truly plug-and-play device and is simply connected to your computer via the supplied USB cable. No drivers are needed for supported operating systems and the transmitter installs itself within seconds as soon as you plug it into your computer. The USB FM transmitter appears as a sound card to your computer and any audio produced by the computer will be transmitted over the USB connection to the transmitter for reception on any standard FM radio. Power for the transmitter is provided through the USB port and therefore there are no batteries required. 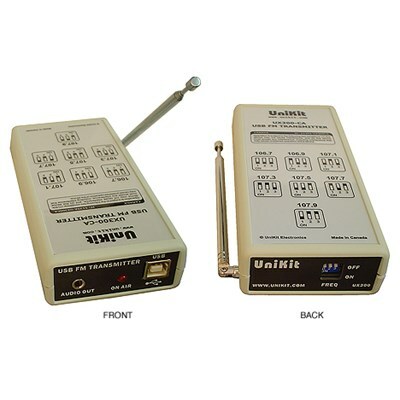 The transmitter offers a choice of 7 frequencies selectable though an easy to change DIP switch. The frequency is PLL (Phase-Locked-Loop) synthesized for high-quality stereo reception. It also offers a stereo audio output jack so that you continue to listen to the audio on your existing speakers at the same time as the transmitter is connected to the computer. MP3 Music Jukebox: Transmit your MP3 music files or any other audio from your computer to your home stereo system or FM radios around the house or office. Internet Radios: Transmit internet radio stations from your computer to standard FM radios around the house or office.